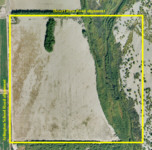 This property can easily be developed into irrigated cropland, or may have potential for sand or gravel operation due to location near the river. This is a skewed rectangular shaped tract with approximately 109 acres of abandoned farmland, 1.3 acres of a well site and yard, 3 acres of farm roads and ditches and 44 acres of river bottom. The property has grandfathered water rights and water stock in the Arlington Canal Company. The property has paved road access on the very northwest corner of the property, at the point which Arlington School Road turns west into Desert Rose Road. 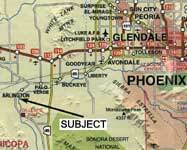 Current access to Interstate 10 from the property is 4 miles north to Old US Highway 80, then 6 miles north and east to Oglesby, then 8 miles north to the I-10 interchange. Please click here to download (about 1MB) a printable brochure in Adobe Acrobat format. If you get frustrated trying to make this work on your computer, don't hesitate to ask us to mail you a printed and bound brochure instead.